Apel, cannot critique ethics, because requires employing an ethical discourse to do so. Gunnar Brievik Is Base Jumping Morally Justifiable? Are risk sports valuable, representing good values? Require 200 jumps from plane before you can jump from a cliff! We are precisely designating those features. Gould vs. Dawkins - Gould rails human chauvinism in definitions of progress - Dawkins: progress as tendency to improve human…. Andrew Courtwright Objections to Maxim - could rethink to use: e.g. When I believe my muscle are not getting enough oxygen, will use epo to boost - motivation for doping: usually a competitive argument, not to get more oxygen to muscles o ME: not sure I accept this, but even if it is true, if I want to do it for that reason, can I? Formula of Humanity - Treating someone as means not acceptable (Respect for persons argument) - Treat someone in a way that they cannot consent, not just that they would not consent - By using PE drugs, are treating other competitors as means o But: if develop a technique that others do not have. This seems impermissible. But need to distinguish this from doping. Not all PE drugs are dangerous, but majority are in the way in which athletes use them. Conclusion: Athletes who dope are performing a wrong action. - Presuming the motivation is to gain a competitive advantage - modify: athletes who dope, just to gain a competitive advantage, are performing a wrong action. Question: based upon your argument, it would seem that iff the motivation is not to gain a competitive edge and is, perhaps, an expression of our ‘posthumanness’, then you do not wish to prevent me from doing this. The problem is, that is the position of international sport. Saturday 915am shouler@optonline.net If my life is finite, why am I watching this damned game? Democracy and democratic citizenship shape and are shaped by technology. Taking the broad approach, this conference invites papers and session proposals bringing insight to the important albeit complicated and intricate relationships among technology, democracy, and citizenship. IDEALS—For example, how can technology be managed so that it promotes democratic ideals? How can technology undermine democratic ideals? Exactly what do we mean by “democracy” and “democratic citizenship”? PROCESSES—This category includes socio-technical systems directly involved in democratic processes, such as voting machines and blogs, as well as broader questions of education, public discourse, deliberation, and decision-making. DECISIONS—Perhaps the broadest category of all, this includes the full range of specific areas in which democracies must establish policy and make decisions—energy, the environment, national defense, transportation, homeland security, health care, regulation of business and entrepreneurship, genetic engineering, funding of research, and more. To propose a paper, send an abstract of no more than 250 words. To propose a session, include a session title and rationale as well as an abstract for each paper. Include the affiliation and relevant contact details for all authors. Please direct electronic submissions and questions to Andreas.Michel@rose-hulman.edu, or write to Andreas Michel, HTA 2009 Program Chair, Humanities and Social Sciences, Rose-Hulman Institute of Technology, 5500 Wabash Ave, Terre Haute, IN, 47803. We will begin reviewing proposals as soon as they are received. Messages to the list are archived at http://listserv.liv.ac.uk/archives/philos-l.html. Prolonged discussions should be moved to chora: enrol via http://listserv.liv.ac.uk/archives/chora.html. Other philosophical resources on the Web can be found at http://www.liv.ac.uk/pal. 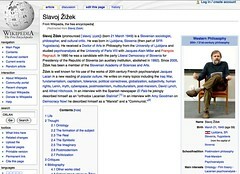 My photo of Slavoj Zizek when he was in Liverpool, added by someone to his wikipedia entry. It's been picked up by a few books for publishing since. 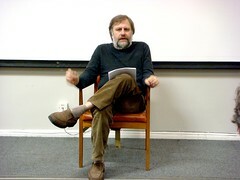 The latest celebrity speaker to grace the European Capital of Culture was the Perver himself Slavoj Zizek. I first saw Zizek speak in 2003 at the Glasgow School of Art. The crowd pressed him on the need for psychoanalysis, but he stood firm to his core and reminded us of old jokes. Dear All, We are lucky to be able to present the internationally renowned cultural theorist and philosopher Slavoj Zizek. Zizek will be speaking on 'The (Mis)Use of Violence' on Monday 17th March between 6-8 at 68 Hope Street, Liverpool. 'One of the most innovative and exciting contemporary thinkers of the left' (TLS) 'The most formidably brilliant exponent of psychoanalysis, indeed of cultural theory in general, to have emerged from Europe in some decades' (Terry Eagleton) Best wishes, This event has been sponsored by the departments of philosophy, SOCLAS, SACE, History and Politics. It is a joint event with the Faculty of Arts, Liverpool John Moores and FACT. They say: Admission is free, but limited to 180, on first-come basis. The RSA event last week was a whirlwind through so many different technologcical futures that tying everything together was quite a challenge. We roved from Web 2.0 to artificially intelligent robot soldiers in a matter of hours. Information technology plays an increasingly important role in society and in human lives. Identity Management Technologies (e.g. biometrics, profiling, surveillance), in combination with a variety of identification procedures and personalized services are ubiquitous and pervasive. This calls for careful consideration and design of collecting, mining, storing and use of personal information. This conference aims to discuss the theme of ‘identity’ in light of new (information) technology. Key-note speakers are David Velleman, Oscar Gandy, Robin Dellon and David Shoemaker. Authors should submit an electronic version of an extended abstract (total word count 800-1000 words). The extended abstract submission deadline is Friday 7th December 2007. Please submit to: ETI@tudelft.nl. PhD students are especially encouraged to submit. Download call for papers. Information technology plays an increasingly important role in society and in human lives. Identity Management Technologies (e.g. biometrics, profiling, surveillance), in combination with a variety of identification procedures and personalized services are ubiquitous and pervasive. This calls for careful consideration and design of collecting, mining, storing and use of personal information. Access, rights, responsibilities, benefits, burdens and risks are apportioned on the basis of identities of individuals. These identities are formed on the basis of personal data collected and stored and manipulated in databases. This raises ethical questions, such as obvious privacy issues, but also a host of identity related moral questions concerning (the consequences of) erroneous classifications and the limits of our capacity for self-presentation and self definition. Which conceptions of identity are used when addressing ethical issues regarding information technology? How can the concepts of ‘identity’ and ‘identification’ be understood from a philosophical perspective when discussing morally problematic developments in information technology? What are the philosophical semantics pertaining to reference and identification which may help clarify ambiguities and ethical issues? How can we arrive at a normatively sound conception of personal identity as a starting point for the study of the ethical aspects of the (information) technology that is shaping our lives? This conference aims to discuss the theme of ‘identity’ in light of new (information) technology. The conference will be held in The Hague, the Netherlands. Registration fees and procedures will be posted shortly. The conference will be organized by Noëmi Manders-Huits. For more information on the conference, please contact ETI[at]tudelft.nl. This week, I was in Oxford briefly at the invitation of Julian Savulescu. 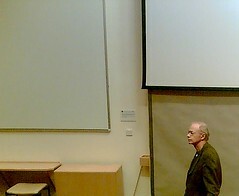 It was a real pleasure to hear Peter Singer speak, having known his writings for many years. The trip was briefer than I had anticipated but long enough to hear Singer's interest to convince governments of their obligation to address global poverty. His argument was, as always, incredibly accessible and will surely appeal to the kinds of intuitions that many people share on this subject. Description and Scope: The IJIRE is the first peer-reviewed online journal, dedicated specifically to cross-disciplinary, cross-cultural research on Internet Research Ethics. All disciplinary perspectives, from those in the arts and humanities, to the social, behavioral, and biomedical sciences, are reflected in the journal. With the emergence of Internet use as a research locale and tool throughout the 1990s, researchers from disparate disciplines, ranging from the social sciences to humanities to the sciences, have found a new fertile ground for research opportunities that differ greatly from their traditional biomedical counterparts. As such, "populations," locales, and spaces that had no corresponding physical environment became a focal point, or site of research activity. Human subjects protections questions then began to arise, acros disciplines and over time: What about privacy? How is informed consent obtained? What about research on minors? What are "harms" in an online environment? Is this really human subjects work? More broadly, are the ethical obligations of researchers conducting research online somehow different from other forms of research ethics practices? As Internet Research Ethics has developed as its own field and discipline, additional questions have emerged: How do diverse methodological approaches result in distinctive ethical conflicts ­ and, possibly, distinctive ethical resolutions? How do diverse cultural and legal traditions shape what are perceived as ethical conflicts and permissible resolutions? How do researchers collaborating across diverse ethical and legal domains recognize and resolve ethical issues in ways that recognize and incorporate often markedly different ethical understandings? Finally, as "the Internet" continues to transform and diffuse, new research ethics questions arise ­ e.g., in the areas of blogging, social network spaces, etc. Such questions are at the heart of IRE scholarship, and such general areas as anonymity, privacy, ownership, authorial ethics, legal issues, research ethics principles (justice, beneficence, respect for persons), and consent are appropriate areas for consideration. The IJIRE will publish articles of both theoretical and practical nature to scholars from all disciplines who are pursuing‹or reviewing‹IRE work. Case studies of online research, theoretical analyses, and practitioner-oriented scholarship that promote understanding of IRE at ethics and institutional review boards, for instance, are encouraged. Methodological differences are embraced. Publication Schedule: The IJIRE is published twice annually, March 1, and October 15. Submissions are accepted on a rolling basis, and are subject to Editorial and Peer Review. Style Guidelines: Manuscripts should be submitted to ijire@sois.uwm.edu <mailto:ijire@sois.uwm.edu> ; articles should be double-spaced, and in the range of 5000-15,000 words, though announcements of IRE scholarship, case studies, and book reviews of any length can be submitted for review. Please ensure that your manuscript is received in good format (proper English language usage, grammatical structure, spelling, punctuation, and compliance with APA reference style). The IJIRE follows the American Psychological Association's 5th edition. Articles should include an abstract no longer than 100 words, full names and contact information of all authors, and an author's biography of 100 words or less. Copyright: In the spirit of open access, IJIRE authors maintain copyright control of their work. Any subsequent publications related to the IJIRE work must reference the IJIRE and the original publication date and url. As conference director for the next international PATT conference to be held in Glasgow next year, I am delighted to be able to confirm that some of the greatest names in the philosophy and sociology of technology have agreed to take part in the conference. They have all (along with others who will attend the conference) recently been published in a book called “Defining Technological Literacy”. This title forms the basis of the conference theme. I will put more information on a web site devoted to the conference when I have it up and running. It will also be of interest to participants, particularly from overseas, that this conference takes place just prior to the CRIPT conference, which in turn, takes place just before the DATA conference. This makes it possible for delegates to attend all three conferences, or any combination, should they wish. (I know that several delegates did attend all three in 2003. There is very little literature directly relating to education about the basic technological nature of the world that young people must negotiate nor about the kinds of technological obstacles that they are likely to encounter in that world. Their views of technology influence their ability to both use and relate to it. Many young people have a tendency to perceive technology in terms of its artefacts: computers, cars, televisions, toasters, pesticides, flu shots, solar cells, genetically engineered tomatoes and so on. Often they do not see technology in terms of the knowledge and processes that create these artefacts, nor are they aware of the various implications for society resulting from these technologies. There is a tendency in the teaching of Technology education at school level, to present information about some pre-existing technologies in an instrumental form. Pupils are then expected to reconstitute this information in the form of concrete artefacts. We do not sufficiently engender in young people an abiding curiosity about how the technologically shaped world in which they live actually affects them. Within the various rationales for Technology education from across the developed world, an abiding and recurring issue is evident: Technology education must engage with the development of informed attitudes about the impact that existing and emerging technologies will have upon their cultural development, as well as the potential and actual consequences these technologies will have upon the environment, both locally and globally. This is known variously as ‘Technological Literacy’ or ‘Technological Capability’. The conference organising committee invites papers that address aspects of teaching and learning in technology education concerned with methods of teaching and learning technological literacy in the classroom. Papers addressing the conference theme are particularly welcome, but authors are invited to submit research papers addressing any topic relevant to technology education. Delegates will come from a wide range of technology education stakeholders – philosophers of technology, teacher educators, teachers, researchers, post-graduate students, policy makers, curriculum developers, consultants, and members of the broader educational community. The second part, taking up in the last three days, will concentrate upon the delivery of the accepted conference papers. It is proposed to set up a web site for this conference which will continue to update conference data. Details will follow in the near future. The conference language will be English. Please e-mail completed papers, which should be in the region of 2,500 – 3,000 words to John Dakers at the above no later than the 30th November 2006. Professor Peter Singer on Global PovertyTuesday May 29th, Tuesday June 5th and Tuesday June 12th 2007 at 4.30 pm in the Martin Wood lecture Theatre (Clarendon Lab, Parks Road opposite Keble. Admission is £15.00 for the day, payable in advance. Plus vegetarian and vegan catering and all day tea and coffee. Bookings now open. Note that the venue is wheelchair accessible on the ground floor only. Please register for the conference using the booking form on the website www.greeneconomics.org.uk and send your cheque payable to "The Green Economics Institute" to The Green Economics Institute, 6 Strachey Close, Tidmarsh, Reading RG8 8EP. Dr David Rodway Philosopher "Ecologism: The new paradigm and revolution in perception & thought in philosophy, science, art, politics & economics - countering the neo-liberal (Cartesian) tyranny, and saving the planet".